Rep. Judy Chu (D-Pasadena), CAPAC chair: “Taking ownership of past mistakes is the only way to apologize for wrongs committed and ensure that they never happen again. 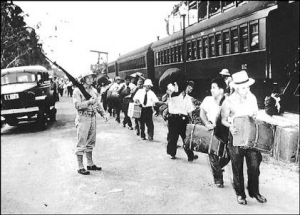 While many Americans may be familiar with the history of race-based internment camps during World War II, most are not aware that the U.S. government also removed 2,300 men, women and children of Japanese descent from their homes in Latin American countries. These innocents were unfoundedly relocated from their homes and lives to be used for hostage negotiations with Japan. Rep. Mike Honda (D-San Jose), CAPAC chair emeritus: “Even as we remember and learn from the experiences of the Japanese, Italian and German Americans who were placed into internment camps during World War II, we must also remember the experiences of Japanese Latin Americans who were unjustly and inhumanely treated during this same time. 2,300 men, women, and children of Japanese ancestry were extricated from across 13 Latin American countries and brought to the U.S., and subsequently placed in internment camps and used as pawns in exchange for POWs in the Pacific. During World War II, the United States relocated approximately 2,300 men, women, and children of Japanese descent from Latin American countries, including Peru, and held them in internment camps on American soil. From 1941 to 1945, these individuals were used in hostage exchanges, orchestrated by the U.S. government, that often resulted in their deportation to Japan or other Axis countries. In 1988, President Ronald Reagan signed the Civil Liberties Act, granting redress to Japanese Americans interned during the war, but this did not include Japanese Latin Americans. Ten years later, following a class-action lawsuit, the U.S. government offered settlements of $5,000 to Japanese Latin Americans (in contrast to the $20,000 offered to Japanese Americans) and a letter of regret.